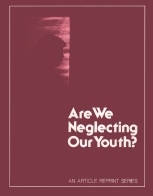 Are We Neglecting Our Youth? Parents are increasingly neglecting their most important responsibility, often with tragic results. It is time to take a closer look at this important subject, for the youth of today are the adults of tomorrow. Never have our young people had more leisure time, better food, better education, or more material goods. Yet youthful violence, aggression, and hostility is more pronounced than in any period of modern history. Forty percent of United States crimes of violence and two thirds of crimes against property (80% of vandalism) are committed by those under twenty-one.